BACAU, Romania — To get around the chronic labor shortages hampering this traditional textile center and in other industries across Romania, Sorin Nicolescu, who runs a clothing factory, came up with an original solution: import 800 workers from China. “The explanation is very simple,” said Mr. Nicolescu, general manager of a Swiss concern, the Wear Company. “We don’t have any Romanian workers because they have all left to work” in Western and Central Europe. Foreign investors have been attracted to Romania, a poor Balkan country, because of its low wages and, since Jan. 1, its membership in the European Union. At the same time, those low wages and freedom of movement through Europe, which is now easier, have been fueling a wave of emigration that threatens to slow an economic boom in recent years in Romania. Romania, a nation of 21.6 million (and declining 0.2 percent annually), received 9 billion euros, or about $12 billion, in foreign direct investment last year. That helped the economy grow last year as much as 7 percent, with an unemployment rate in January of 5.4 percent — well below the European Union average. But with monthly wages averaging around $375 after taxes, roughly two million people, or more than 8 percent of the population, have left since the Stalinist government of President Nicolae V. Ceausescu fell in 1989, according to analysts’ estimates. Italy and Spain are the most popular destinations for Romanian workers, where they usually perform manual labor, legally and illegally, and generally for lower wages than local people. Mr. Nicolescu said he decided to look for workers in China because he had contracts there, and those companies had put him in touch with an employment agency. Those who are hired pay about $2,000 for transportation and the employment agency’s fee, according to one worker. Once they reach Bacau, a drab industrial city of 181,000 some 150 miles northeast of the capital, Bucharest, they go to work in a large, inconspicuous warehouse on the outskirts of town. 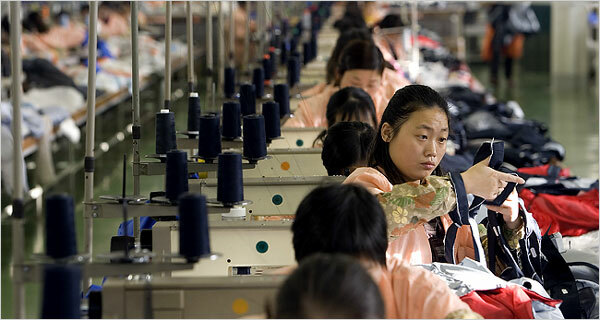 Inside, about 170 Chinese women operate sewing machines attached to tables stacked with finished and unfinished garments. Most of the tables, arranged in long rows, are empty. The plant expects 500 more Chinese workers by the end of May. The factory is clean, freshly painted and well lighted. The only sound is the rapid, repetitive thud of the sewing machines as the workers stitch together previously tailored pieces of garments. They make mostly sportswear for a range of brands, including Prada and Carrefour. All the production is for export. Mr. Nicolescu said he paid the women about $347 a month after taxes. The legal minimum wage is 132 euros a month ($176) after taxes. The company operated with Romanian workers until 2003, when operations were suspended because the work force had dwindled to 200. Mr. Nicolescu said the company had posted hundreds of job offers at a local agency, but they had gone unanswered. “It’s very difficult work, and it’s not well paid,” Mr. Nicolescu acknowledged. He said the industry found it hard to attract young workers to replace the current ones, most of whom are nearing retirement. “I’m not very pleased about working with foreign workers because I have to provide them food and housing” on top of their salaries, Mr. Nicolescu said. That amounts to $130 a month for each employee, he said, in addition to more than $500,000 he has spent building worker dormitories. Critics say the company would find Romanian workers if it offered better wages. But Mr. Nicolescu replied that higher wages would make his products uncompetitive internationally, pointing out that textile manufacturers had already left much of Europe in search of lower costs in regions like China. Xiu Xian Hong, from Fujian Province, who came here last July, described life as better than in China. “It is quiet here, and the air is much cleaner,” she said through a translator who worked at the plant. “The work is the same, but the pay is more.” But she said she missed her 3-year-old daughter and her husband back home. Ms. Xiu said she had come to Romania because it was the only place being offered when she sought work at an agency in China. She said she planned to stay at least three years, hoping to save enough money to start a business, perhaps a shop, when she returned. Although the city center is easily accessible by public transportation, the workers spend most of their free time in five-bed dormitory rooms in the factory complex, playing cards, reading books and watching Chinese satellite television. Few local residents have seen the workers in town. People in a city park one recent afternoon said that they had learned about their new neighbors from newspapers and television. “Our people have gone to the West and all over the world, so we need others to replace them,” said Dumitru Padure, a retired aircraft factory technician. A variety of intra-European transportation links here illustrates the scale of emigration. A discount Romanian-based airline, Blue Air, offers six direct flights a week from Bacau to Italy — two to Turin and four to Rome. A bus company, Atlassib, one of many, runs 10 buses daily to Italy from Bacau. The population of Romania is projected to fall by 29 percent, below 15.5 million, by 2050, according to the Population Reference Bureau in Washington. Villages and towns outside Bucharest have been hit especially hard. Ms. Barbu of the Bacau employment agency suggested that wages would need to reach levels about three-quarters of those in the West for Romanian workers to return.